14,175 exuberant runners and walkers of all ages and abilities, coming from 38 countries, enjoyed the cloudy and wet conditions in the 39th edition, which also offered 21.1 km Half Marathon, 8 km and McDonald's Kids MaraFun races. The marathon route is one of the most scenic in the world, taking participants through Vancouver's famous Stanley Park, False Creek, over the Burrard Street Bridge, and into the Kitsilano and Point Grey neighbourhoods. 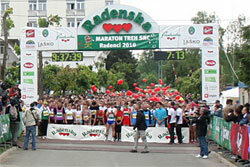 Iaroslav Musinschi took the 8th edition in a course record of 2:08:32. The 33 year-old Moldavian also established a European season's lead, being the first European to clock a sub 2:10 time in 2010. 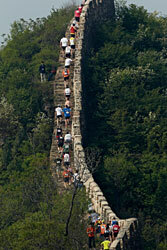 Among all events a record number of 13,000 athletes took part, including 4200 in the marathon. Musinschi was paced through halfway in 64:04 minutes and then almost kept his pace, finishing more than three and a half minutes ahead. In the women's race Turkey's Mehtap Sizmaz was well ahead early on, but eventually dropped out to leave Natalya Volgina in the lead after around 25km. Stanley Biwott won in a time only two seconds outside the course record — also the South American all-comers record of Vanderlei de Lima. The help of two pacers and a special prize of $20,000 was not quite enough to offset the 24°C finish temperature. 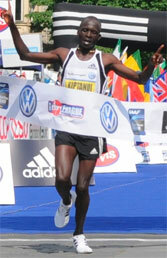 Biwott ran his second fastest marathon: "I knew I was close, but did not have the strength to sprint". Race director Thadeus Kassabian was pleased with the course changes: "The course gave excellent results, and the course record did not fall only because the temperature shot up during the race. 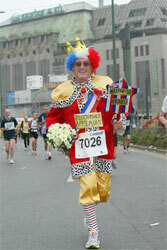 The Sao Paulo Intl Marathon remains the fastest of any in South America" he said. In the women's race Marizete Moreira dos Santos maintained home advantage (13 wins in 16 editions). At first she ran with Margaret Okayo and behind the leaders Marily dos Santos and the Ethiopian Debela Nega Mesfim. Dos Santos led until 40km, after which her thighs cramped and she slowed, allowing Moreira, Okayo and Adriana Aparecida da Silva to come past. 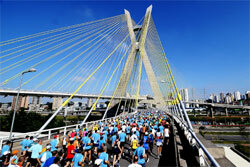 Da Silva was running in Sao Paulo for the first time, and found it to her liking. In total, the 16th edition of the event attracted a record 20 000 entrants including those in the children's event — The Maratoninha of Sao Paulo which brought together children from social projects and from prestigious schools. Large numbers of children under 6, 7, 8, 9 and 10 also attracted many proud parents. Volcanic ash prevented Eliud Kiptanui of Kenya going to the Vienna Marathon three weeks ago, but produced an explosive performance in Prague, leading both Yemane Tsegay and Nicholas Kipruto Koech under the old record of 2:07:48 set last year. Helena Kirop dominated the women's race, breaking away at halfway, and surpassing Maura Viceconte's 2001 course record of 2:26:33. Kiptanui's anonymity and aggressive front-running may have led rivals to think he was a pacemaker. He went away from 35km, after race favourite Tsegay had already dropped off the pace into fifth place. As Kiptanui ran the second half of the race almost a minute faster than the first, in 62.23 to 63.16, Tsegay regrouped, to take second. Kiptanui had won the Safaricom Marathon in Kisumu, Kenya in December in hot (30°C) and humid conditions. His huge improvement in Prague was the sixth fastest time so far this year and the 17th on the all-time list. Despite fighting back to gain second place, Tsegay did not disguise his disappointment, but Koech was overjoyed with his debut marathon. Samuel Kosgei and Mary Keitany set unique double world records - never before have both records been broken in one race. Keitany became the first female to dip under 1:20. 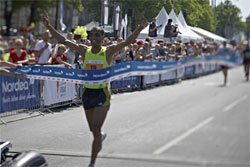 BERLIN RUNS registered 10,114 runners from 47 nations in the 30th edition of the race. A group of more than 20 African runners surged through 5km in 14:29, 10km in 29:01 and 15km in 43:05. As the group fell apart it became a duel between Kosgei and Gilbert Kirwa. At first defending champion Matthew Koech ran with them, but he soon dropped back. The pace kept high although the section 18-21km is slightly uphill. 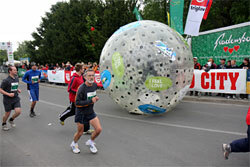 The pair reached 20km in 57:22 and achieved a remarkable half marathon split time of 1:00:42. 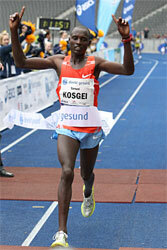 In the final 2km 24 year-old Kosgei opened a decisive gap. Altogether seven runners finished inside 1:14, among them the former record holder Paul Kosgei. He had been in the leading group until close to 15km. From the start Mary Keitany ran her own race at the front, keeping pace for around 1:20. She passed 10km in 31:58 and then clocked 47:58 at 15km. Even when the course climbed back up to the Olympic Stadium she kept her rhythm and speed to finish almost five minutes ahead of Alice Timbilili. 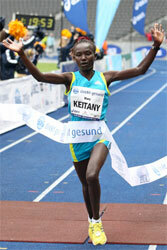 "I prepared long and hard for this race and I expected to break the record" said Keitany. "But not by such a big margin or to run sub 1:20." She will make her marathon debut in autumn. A record number of runners participated, with 330 in the marathon and half marathon race, and about 2000 in the humanitarian race over 5 km. A wonderful atmosphere and warm weather (17°C to start, 25°C at the finish) yielded new course records to both Tamas Toth (2:28:56) and Lucia Kimani. Up to 28km the Bosnian Dzuro Kodzo, who had announced before the race that he would run under 2:18:00, had a 2km lead. He slowed after 30km and eventually had to stop, allowing Toth and Neals Strick (NED) to take the lead. Lucia Kimani and Marija Vrajic led the women's race up to half way, at which point Kimani took control and ran on to a new course record. Titus Mbishei and Wude Yimer were surprise winners, but won in contrasting ways writes Ram Murali Krishnan. Mbishei led from early on, while the diminutive Yimer was only visible in the lead group once it started to whittle down after 6km. Defending champion Deriba Merga, after a late arrival the night before due to a cancelled flight, gallantly maintained contact with the lead group until about 6km, but then tailed off. Moses Kipsiro, runner up in the World Cross ran shoulder-to-shoulder as they passed the ornate Vidhan Soudha building at 7.5km and entered Cubbon Park at 8km. They increased pace on the gentle decline of the beautiful inner roads of the park. The gap back to Lelisa and Merga continued to widen. Mbishei entered the stadium first with Kipsiro chasing on his heels over the final 350m. Mbishei posted a personal best 27:54, but missed the course record by just three seconds. "I was unable to cope with the pace," Merga admitted after the race. An array of globally renowned runners, including three past winners, made for an exciting lineup in the women's race that followed at 08:00. Turkey's Elvan Abeylegesse, the double silver medallist at the Beijing Olympics, did the early front running. Kenyan Grace Momanyi, who tied for the top spot with Abeylegesse at the inaugural race here in 2008, along with teammate Gladys Chemweno and Ethiopian Aberu Kebede, went past the mid-way mark at 16:10. By 6km Abeylegesse began to drop back as Momanyi took the lead with defending champion Aselefech Mergia, and Yimer tucked in behind. Momanyi strove to get a lead but entered the stadium with Mergia and Yimer running alongside, about to pounce. Yimer kicked with 200m to go and clocked a new course record of 31:58. The winners each took home US$21,000. Indian winners Sunil Kumar and Preeti L. Rao won US$ 3200 each. Earlier Mr B.S. Yeddyurappa, Chief Minister of the State of Karnataka, flagged off the races. 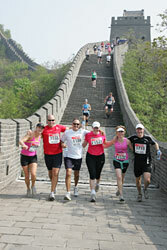 Runners came from 45 countries to participate in one of the five different races spanning various distances. 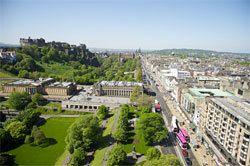 In total, more than 10,000 runners finished, 25% up on last year. The marathon events were won by Slimani Benazzouz and Maryna Damantsevich, who shattered the previous women's event record dating back to 1991, by an amazing 5:37, although this year's race was run over a new course. Of all runners in the full marathon, 57% were from overseas. Many Finnish runners opt to run their spring marathon in Riga — this year one fifth of the marathon competitors came from Finland. 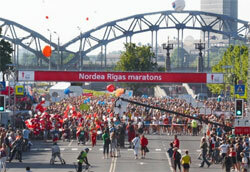 Nordea Riga marathon is the largest marathon in the Baltic countries. The next ecition is scheduled for 22 May 2011. Durban based Zimbabwean Stephen Muzhingi ran a pace-perfect race to defend his crown in the 85th edition "down" from Pietermaritzburg to Durban writes Norrie Williamson. Of 23500 entered 16400 lined up for the start in ideal conditions. A large group of runners went in search of the early hot spot awards but after 18km contenders started to find their rhythm albeit still considerably faster than record pace. On the 'big dipper' outside Camperdown Zimbabwean Wellington Chidodo sprinted to the first hot spot in 1:30:51, earning R8000 and putting Charles Tjiane into second position, three minutes adrift. Over the next 18km, after the second hot spot (halfway, 2:37:15), Tjane overtook Chidodo and led the race, almost nine minutes clear of Fanie Matshipa, Stephen Muzhingi, Bethuel Netshifhefhe and Claude Moshiywa. But it was this group who contested the lead over the later stages of the race. 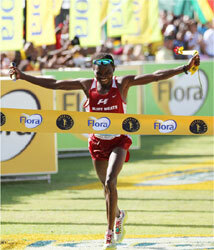 "When we went through halfway in 2:46, I knew the record was not possible and concentrated on the win," said Muzhingi. They reeled in Tjiane with 28km to go, although Netshifhefhe had earlier fallen back, Moshiywa and Matshipa pulled away from a more cautious Muzhingi as they approached Fields Hill. Although Moshiywa secured the third hot spot and R16000 on the Pinetown side of Cowies hill, it was Muzhingi who took the lead as they headed for the finish. "The people of Durban know me because I train here and they energized me when I needed it most," said Muzhingi who went on to take the honours in the 10th fastest winning time. The combination of a fast early pace and no clear favourite resulted in wholesale change among the leading finishers over the final quarter of the race. In his debut run Ludwick Mamabolo worked his way through the field from a distant 16th position at Camperdown to finish second and first novice in 5:35:28. Sergio Motsoeneng's 1:41 at Camperdown put him outside the top 50. As one of the twins who had 'relayed' their way down the Comrades route in the 1990s he had been virtually banished from the sport, but from 36th at half way, he climbed to 12th Winston Park, entered the top ten before Cowies and finished in a remarkable third, only 29 seconds behind Mamabolo. Although the Nurgalieva twins dominated the race for a seventh year, Elena and Olesya looked to be making an attempt on Frith van der Merwe's down run record as they set out from Pietermaritzburg on 5:50 pace. "We were concerned about Anna Pichrtova. 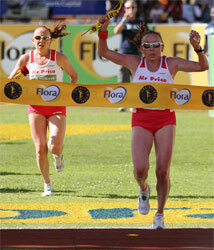 She has won the National 100km championships a couple of times and we didn't know what she could do," said Elena. "When we were told at halfway that we were over 10 minutes ahead we decided we didn't need to go as fast." Even with that more conservative second half Elena led the pair across the finish line in 6:13:03. "Elena was stronger than me today and she deserved the win" said Olesya who was right on her heels. This was Elena's fifth Comrades crown, now three ahead of her sister. 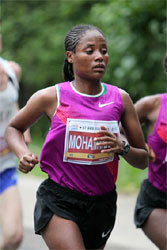 Farwa Mentor was the first South African to finish, a title she has now earned eight times. She ran almost seven minutes faster than last year. Japan's Arata Fujiwara won an intelligent, tactical victory in a new course record of 2:09:34 writes Alan Brookes. 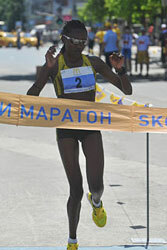 Merima Mohammed (18) claimed the women's crown with a strong solo run of 2:28:19. Over 39,000 runners from more than 30 countries took part in the 5 events on Saturday evening and Sunday morning in Canada's national capital. 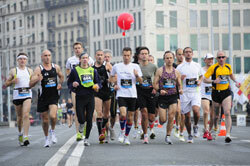 A capacity crowd of 4,500 ran the marathon, with another 10,000 in the half marathon. After a sweltering week the weather cooperated on race day (15°C, cloudy and and little wind). 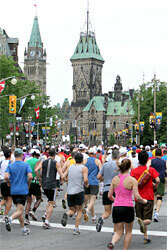 The undulating course begins outside City Hall, then immediately passes the majestic Canadian Parliament buildings before winding its way back and forth across the scenic Ottawa River and Rideau Canals. Crossing over into the province of Quebec, a lead group of 20 men passed 3km in 9:05, pursuing the 2:08:32 Canadian all-comers record, passing 10km in 30:23 and halfway in 64:30. By 25km, there was only one pacer left among a pack of 10 — with Fujiwara watching from the back. The pace dropped before the pacing finished at 30km. Hillary Kimayo immediately surged to the front of a group now reduced to five. When Laban Moiben made the next move at 37km only Fujiwara responded. The two ran shoulder to shoulder until 400m to go, when the powerful Japanese surged ahead to a new course record. It was his first marathon win, after only two months ago abandoning the traditional Japanese corporate system, and walking away from a long-term, star position with Team JR Higashi Nihon, in order to gain the freedom to race more internationally. He was all smiles after the race, saying he'd found motivation from a breakfast meeting on Saturday with Deriba Merga who was in town to race the 10K on Saturday night. Second-place Moiben was delighted to have lowered his best time by almost four minutes. Saturday night's 10K, billed as the $100,000 chase for the world record, started off with a spritely first kilometre of 2:34, but a travel-weary Merga was never going to threaten. In the end the pacemaker Lelisa Desisa and Moroccan Mohammed El Hachimi battled the wind home along the canal in a spirited duel won by the Ethiopian with Merga third. Dire Tune, starting four minutes ahead of the men, ran completely on her own to hold off the men by mere strides and win the "Battle of the Sexes" and another $5,000. Ellie Greenwood cruised to a convincing win to slice more than 10 minutes off the women's event record. 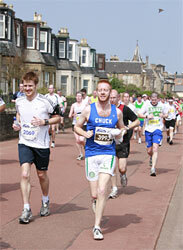 In the men's marathon Graeme Wilson led home a record field of close to 1200 runners. Another 7,500 individuals participated in the half marathon, 10km, 4x10km corporate challenge, kids marathon and 5km walk and run. 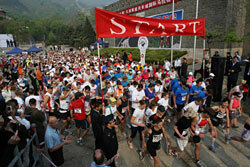 The race attracted runners from 11 provinces and 16 countries. The inaugural Scotiabank Group Charity Challenge also raised an impressive $250,000 for 19 local charities.